Those of you who read my review for the first Jurassic World: Fallen Kingdom trailer know that, at the time, I was pretty optimistic about this film. Blockbuster tropes peppered the trailer, but I maintained hope we’d get a film worthy of its predecessors. Well, it’s now been nearly a month since I first saw Fallen Kingdom. I was fortunate enough to see it early while I was in the UK. I saw it two more times when I arrived back to the US. After three screenings, I’m still struggling to wrap my brain around this film and how I feel about it. I’m a lifelong Jurassic fan. I have been for as long as I can remember. So, I suspect–and I would encourage–that you’ll take my review with a grain of salt. However, I’ll try to do my best to discuss Fallen Kingdom on the merits we might explore for films like Dunkirk, Avengers: Infinity War, or Downsizing. I definitely have a bias, but I will do my best to rein it in. My Kingdom for a Dinosaur! Jurassic World: Fallen Kingdom picks up three years after the Jurassic World incident. 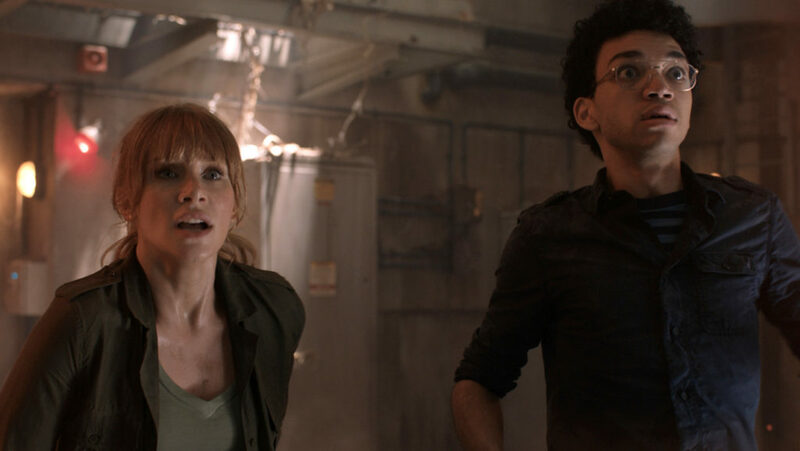 Claire Dearing (Bryce Dallas Howard) is now the head of the Dinosaur Protection Group (DPG). With the group, she is working hard to save the dinosaurs of Jurassic World from an impending volcanic eruption on Isla Nublar. After the US Senate rules after testimony from Dr. Ian Malcolm (our dear, beautiful Jeff Goldblum), against any involvement in rescuing the dinosaurs, Claire is contacted by Benjamin Lockwood (James Cromwell). 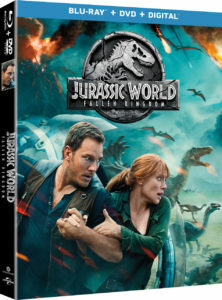 Lockwood–John Hammond’s former business partner–along with his aide Eli Mills (Rafe Spall), convince Claire to join their mission to save the dinosaurs. They need Claire’s expertise and authority in the park’s systems to help them track down the dinosaurs–in particular, the velociraptor Blue. Claire recruits Owen Grady (Chris Pratt) to come with her. Along with DPG’s paleo veterinarian Zia Rodriguez (Daniella Pineda) and systems analyst Franklin Webb (Justice Smith), they join the rescue operation on Isla Nublar. In the process of trying to catch Blue, the dinosaur is injured. The DPG is double-crossed and left to die in the volcanic eruption. With luck, Claire, Owen, Zia, and Franklin all make it onto the departing boat as the island explodes, eventually making it back to Lockwood’s Manor. Our heroes learn Mills has been secretly planning to auction off the dinosaurs to fund a new venture: developing a new line of hybrid dinosaur for military applications called the Indoraptor. Because of Blue’s ability to be trained and to command her fellow Raptors, Mills needs her alive to help him control the hybrid and its future lineages. Claire and Owen (and company) eventually free Blue, face off against the Indoraptor, and become faced with a difficult question: do we let the dinosaurs live amongst us? Aesthetically, Fallen Kingdom is wonderfully crafted. JA Bayona, well known for his work within the horror genre, does a great job with infusing his style into a studio film. The film takes a tight, claustrophobic hold on the audience through the design of its sets and scenes. Truly, Fallen Kingdom–despite the geographic scale it actually occurs in–feels as though it’s happening in confined spaces. This lends itself well to the climax of the film: the proverbial box is broken open, and the dinosaurs escape. This built-in claustrophobia also serves to heighten the tension of every scene. Around any corner, danger might be lurking. The audience’s frame of view is limited over and over again, causing us to always be on-edge. We don’t know for sure where danger is, or if it’s there in the first place. One of the best examples of this in Fallen Kingdom is a scene in which Claire, Owen, and Maisie (Isabella Sermon) creep through cramped dioramas in a pitch-black atrium to try and avoid detection by the Indoraptor. It’s such a well-done sequence, and how it’s shot makes the danger prescient, potent, and uncertain. No doubt this infusion of the gothic into Fallen Kingdom was Bayona’s intent, and he executed masterfully. Truly, he has delivered a beautiful, horror-infused chapter of the Jurassic saga. There’s a way to balance these well in a unified plot. Fallen Kingdom, unfortunately, fails to achieve that balance. Most of this I don’t blame the filmmakers for; they have studio heads they have to answer to who prioritize big action and effects over well-written and executed stories. As a result, the film looks spectacular but is wanting in character depth. As well, it contains plot contrivances that fail to pull the wool over the audience’s eyes. Much of the plot was given away in the trailers, which made it that less compelling to watch. 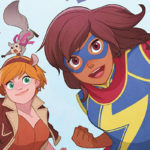 You already knew basically everything that was going to happen, making a particular twisting involving Lockwood’s granddaughter, Maisie, fall flat. Canonically, I don’t disagree that the twist can be seen as a natural progression of the ideas Michael Crichton first brought to the table with Jurassic Park, but it just didn’t land well enough (in this author’s opinion). Blue and the Indoraptor had a lot more potential than they were given in Jurassic World: Fallen Kingdom. There were also places where the narrative called out what could have been great franchise moments, only to later abandon them. The stories of Blue and the Indoraptor, if developed more and posed as foils of each other, could have created a dynamic and narrative tension that would have paid off so well. There are seeds of this idea planted around Fallen Kingdom’s story. The film’s breathless pace doesn’t allow us time to stop and explore. Nevertheless, it’s hard to fault Fallen Kingdom for its ambition. Narratively, it’s perhaps the most experimental Jurassic film. 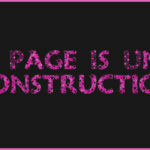 It also makes sincere efforts to move past the shortcomings of some of its predecessors. The fact that the filmmakers did their best to squeeze two films into a single installment is worth acknowledging. As well, Fallen Kingdom’s conclusion does something its Jurassic kin have been unable to do: move past the islands. We’ve now returned to the islands off Costa Rica five times. Even just after the second time, audiences’ eyes were rolling. With the animals on the mainland, new narrative pathways are available for exploration. It will be interesting to see whether the filmmakers explore those paths, or stick to what they know instead. Fallen Kingdom does make an honest attempt at something noble: making the dinosaurs into characters. 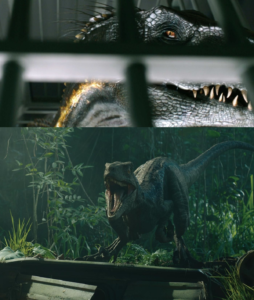 As an extension of ideas developed in Jurassic World, this attempt is not without merit; without anthropomorphizing too much, certain species of animals can be seen as having “personalities”. Temperament, level of intelligence, size, etc. all contribute to why one of your cats likes to bite you at every given opportunity while the other enjoys snuggling under your arm at odd hours of the night. Fallen Kingdom tries to achieve this with its dinosaurs, especially Blue. With this shift, however, has come a fundamental change within the franchise. Where the original Jurassic Park (and The Lost World: Jurassic Park to an extent) depicted the dinosaurs mostly as animals responding to their environments, this new trilogy seems to have abandoned that legacy. The dinosaurs in Fallen Kingdom exist purely to either threaten our characters or provide dramatic or comedic relief. A Pachyrhinosaurus stops to lick Owen Grady’s face before fleeing the oncoming lava flow. The infamous T. rex, in deus rex machina moments (the inspiration for the title of my own blog), appears out of nowhere not once but twice to either save our characters or deliver justice. Blue, despite being injured, doesn’t think twice about intervening to save Owen and Maisie. The Indoraptor–despite the fact we’re told it “needs a mother” and there’s a real genuine moment where we see a glimpse of it as a complicated, intelligent animal–becomes a pure villain our characters have to run from or fight. In comparison, take moments from the first film; from the T. rex paddock escape to the sick Triceratops, the dinosaurs are responding to their environments in a way that seems genuine and in-line with what their natural instincts would be. Alan Grant (Sam Neill) even goes out of his way to say: “They’re not monsters, Lex–they’re animals.” This idea seems to have been replaced with the notion of dinosaurs as spectacle. Their importance in the films is now their utility for the human characters. This is why the on-screen theropods bite at everything that moves while herbivores are used to break humans out of lock-up. This is a regression of the work Jurassic Park did in advancing public understanding of dinosaurs. Before Jurassic Park, the idea of dinosaurs as warm-blooded, fast-moving, birdlike, socially dynamic, and intelligent animals was not well understood in popular culture. While attitudes had evolved, the notions of these creatures as evolutionary failures were still pervasive. Jurassic Park caused our public imagination of dinosaurs to shift dramatically and positively. 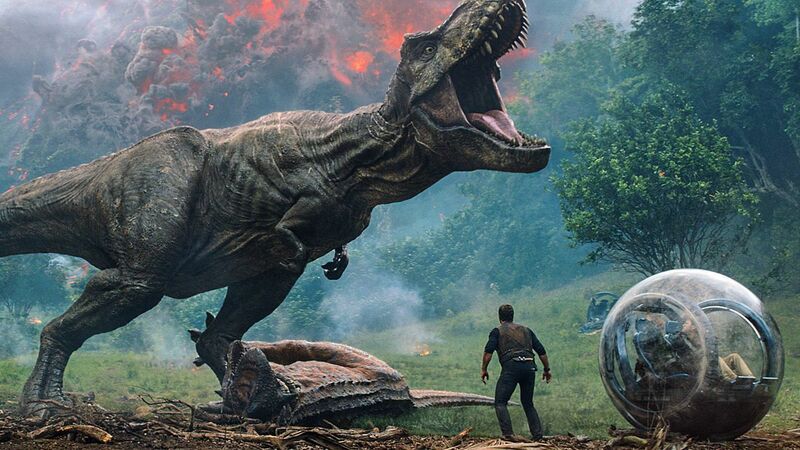 With this new iteration of Jurassic films, we’re seeing that undone in favor of spectacle. Is This Dude Just a Whiny Fanboy? The short answer is: maybe. I acknowledge my review may be rooted in a bias that’s too deep to overcome. I’ve done my best to counteract that by discussing the film’s merits, giving it credit where it’s due. However, I will admit the film has left me feeling antagonized and uneasy with each viewing. Even though I’ll likely go see it a fourth time–and perhaps a fifth (God, why? )–Fallen Kingdom may not ever sit well with me. When I saw it for the first time in the UK, I walked back in near silence to my hotel, crashed on my bed, and said nothing for almost an hour. I was dumbfounded by what I’d seen, and not in the good way. If you find this overdramatic, I don’t blame you. I did too. We each get out of a film what we go in anticipating, which I think is part of the reason why I had such a volatile reaction to Fallen Kingdom. I truly believed, through early glimpses, that it could be the spiritual successor Jurassic Park needs. Especially with a young, ambitious director with a distinct eye and style, combined with the care Colin Trevorrow (director/writer, Jurassic World) brings to his other projects, there seemed to be a lot of promise here that for me, at least, didn’t pan out. However, I suspect my reaction is more in the minority. Therefore–like I said before–take my review with a grain of salt. It’s hard to give a final verdict on Jurassic World: Fallen Kingdom that isn’t tinged with bias. If you’re a discerning moviegoer, I think the best recommendation I can give you is Wait and See. However, if you’re up for a popcorn flick with lots of teeth and danger, go see it! For those up for a fun time, it won’t disappoint.